If you don’t like pecans, you should stop reading after this sentence. Also, you should question yourself. Pecans are a national treasure. They are chockful of vitamins and a great source of protein as well as manganese. For those unfamiliar with manganese, this is a hard-to-come-by bioavailable nutrient in the body. While it is in the body at most 20 mg, many people don’t get enough of manganese, so we think that’s reason alone to eat some pecans today! Your health will thank you. 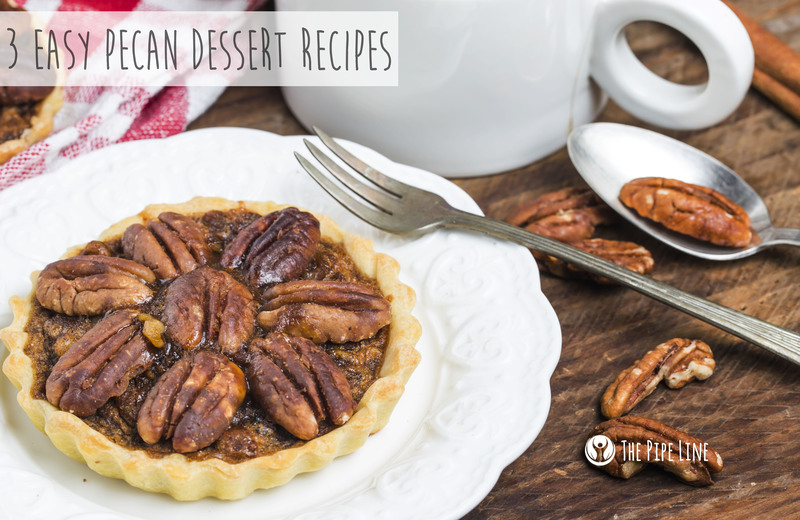 Would our compilation be complete without pecan pie? No way. No how. Here is a quick recipe to make mini-sized versions of this classic favorite. First prep by beating eggs in a bowl and set aside. Then, make the syrupy goodness by mixing together your sugar and corn syrup in a pan on the stove. Mix until smooth. Add this to your pre-beaten eggs, and blend with a whisk. Lastly, time to add in your butter, vanilla, and of course pecans! Split evenly into all the tart shells and bake in oven on 350 degrees for about an hour. Do check-ins to make sure they don’t burn. If you’re a breakfast person, then here’s a quick recipe to start your day on a yummy note. This pecan oatmeal is super easy to make and by no means will leave you hungry (only, you may be left craving more). On a stove top, prepare your oatmeal. This is super simple, and we’re sure you’ve made it before. Bring 1 cup of water to a boil, and add in your ½ cup of rolled oats. Let it cook, fluff, and put in a bowl. Drizzle the maple syrup, pecans and dark chocolate chips on top. Add milk if you desire for more of a “cereal” feel. We love pecans, sea salt and chocolate. So, it is only natural that we found this no-bake recipe intriguing and immediately placed it to the top of our “must make” list. It consists of three layers: first gooey brownie, second nutty pecan pie, and third salty chocolate. Excuse us while we drool. Since the recipe is pretty extensive, we figure it best to send you straight to the amazing source itself: find the recipe here.